First mix the flour, oil and salt in a large vessel. Brush it with oil and keep the dough aside for a few minutes to rest. Again knead the dough a bit and make small equal sized balls. Flatten them slightly. Roll the dough out into circles with a help of a rolling pin. Dust the wheat flour at regular intervals on the board. 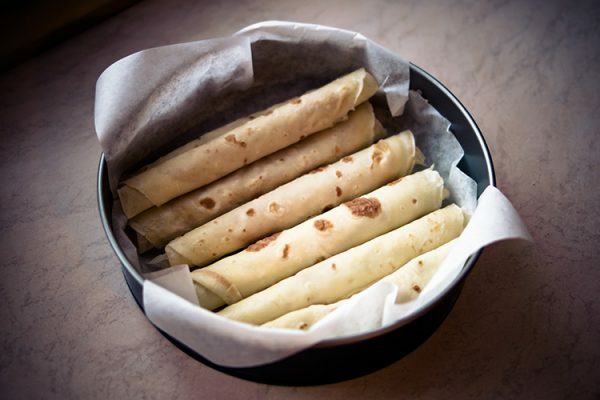 The chapati has to be evenly thin and around 7 to 8 inches in diameter. Place the chapati on a well-heated flat pan (tawa). Flip it as soon as it changes colour to light brown. Flip it again only when you see brown spots on the chapati. Flip it for the final time to allow the other side to roast until brown spots appear. Smear a few drops of oil or clarified butter (ghee) on one side of the chapati, and then it is ready to serve.